Series E, F, Northern Ireland Issue, commencing 1929. The National Bank was formed in 1834 in London by Daniel O’Connell and the Nationalist Party as The National Bank of Ireland. The deed of covenant was signed on 6 January 1835 by 249 shareholders. The first Branch opened in Carrick on Suir either on Monday 26 or Wednesday 28 January 1835 (history appears not to have recorded what the exact date was!). The Bank’s first Governor was Daniel O’Connell, a fact which earned the Bank the nickname of The Liberator’s Bank. The bank aimed itself at farmers and at country business outside Dublin. It expanded its branch network rapidly, but refrained from moving into Ulster to any significant degree as the province was then well covered by banks. In 1856 the Bank’s name was changed to The National Bank Ltd., as it commenced business in London. 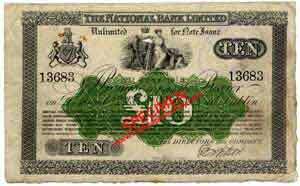 The National Bank issued its first notes in 1835. 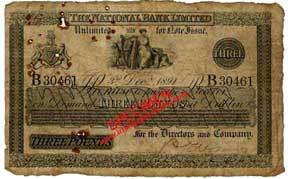 It issued Consolidated Banknotes in 1929, as well as its own Northern Ireland issue. In 1966 the Irish Business of the Bank was taken over by a new company called The National Bank of Ireland Ltd., which was set up as a subsidiary of The Bank of Ireland Group. The National Bank was subsequently taken over by the Bank of Ireland.